UPDATE: Keene won the Pumpkin War with 29,381 carved and lit pumpkins and will receive $1 for each pumpkin for their schools from Discover Card. Highwood, IL tallied up just over 22,000 pumpkins and will get a consolation prize of $10,000 from Discover Card for their schools. We’ve been busy at Paragon carving up pumpkins for the Keene Pumpkin Festival. This year was a big year for Keene, the Properties Brothers are filming a Halloween special called Pumpkin Wars for HGTV, we tried to reclaim our world record for the most lit Jack O’Lanterns and Discover Card is donating $1 for each pumpkin to local schools if we beat Highwood, IL in the Pumpkin Wars. 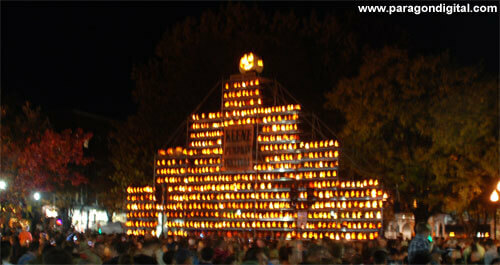 We fell short of the world record with 29,381 carved and lit pumpkins. That’s over $29,000 for local schools if we beat Highwood! We won’t know who won the Pumpkin Wars until the special airs on HGTV on October 31, 2012 but even if we didn’t win, it was a lot of fun and a great thing for our great city of Keene! Keene is known for carving creative pumpkins unlike some other current and past record holders who had assembly lines pumping out pumpkins that look like they were carved with crowbar. So here are our creations. 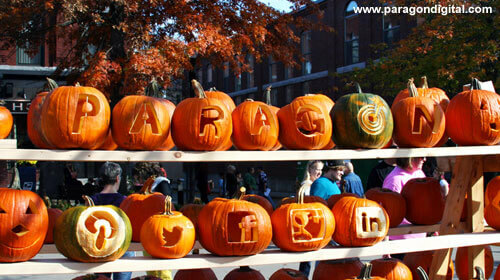 The Paragon logo pumpkins lined up with our social media icon pumpkins below them. The Twitter Logo Pumpkin, Facebook Logo Pumpkin & Google+ Logo Pumpkin carved by Paragon at the Keene Pumpkin Festival.